I am not sure at what age I’ll outgrow apple picking, but I am thrilled to report that 30 is not it. 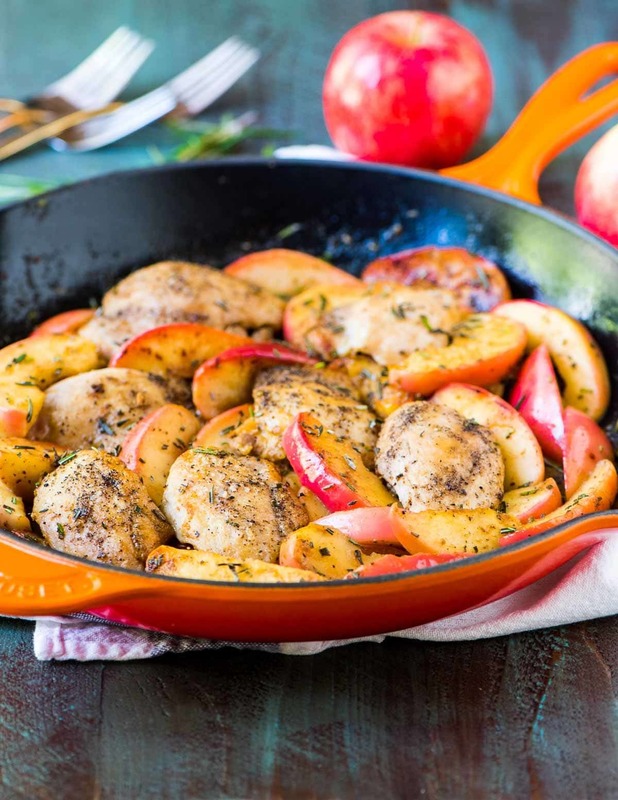 After a day at the orchard with girlfriends, I have an outlandish supply of apples, which means it’s time for another round of this sizzlin’ Apple Cider Chicken Skillet. What’s happening in the pan: apples caramelizing; juicy chicken searing; apple cider bubbling; rosemary making your whole kitchen smell like fall. 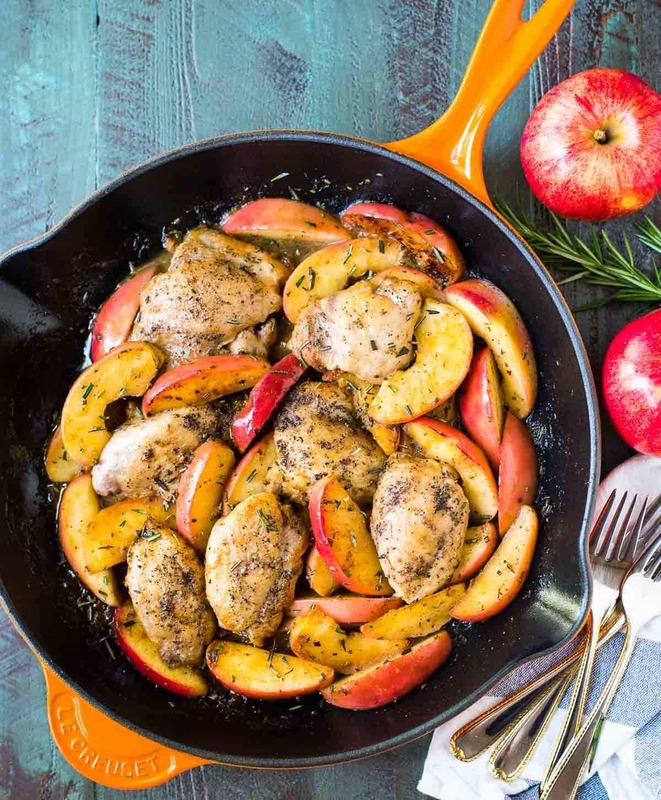 This Apple Cider Chicken Skillet is a healthy, simple meal takes just ONE PAN and is ready in 30 minutes. She’s a finalist for Miss Fall Dinner, and I must say, she has an excellent shot at the tiara. This post and video are sponsored by Pick ‘n Save. I’m relieved that this recipe was a hit at our house, because after Sunday’s apple picking extravaganza, I have A LOT of apples to go through. I’m not sure what it is about being at an orchard that makes me lose all reasonable sense of quantity, but I drove home with a toddler-sized bag of apples in the passenger seat beside me. I drove halfway home with an apple cider donut. Unlike the apples, it didn’t survive the journey. This is my one trip to the orchard for the year, so when my apple supply dwindles—which between today’s Apple Cider Chicken Skillet and THIS apple crisp, I’m forecasting to be sooner than later—I am grateful to have easy access to another source of local apples, Pick ‘n Save. Pick ‘n Save is my local grocery store, and the largest buyer of local produce in Wisconsin. You can even read about the different farmers growing the apples (and a wide variety of other produce) here. How neat is that? ^^I’m sorry, I had to go there. 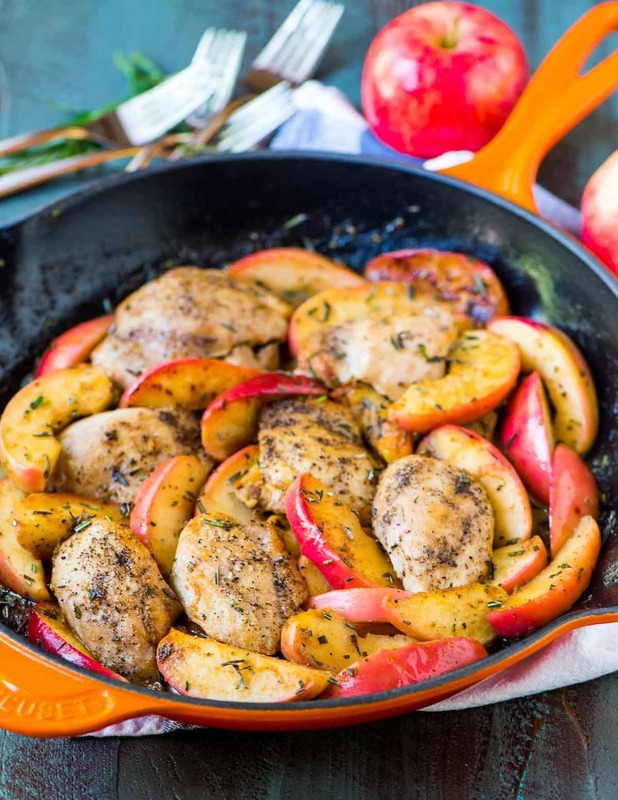 Have an extra bite of this Apple Cider Chicken Skillet, followed by an Apple Oatmeal Cookie, and forgive me? Apple Cider Chicken. Juicy chicken cooked with fresh apple cider, caramelized apples, and rosemary. An easy, healthy dinner that cooks in just ONE PAN! Heat 2 teaspoons of oil in a large skillet over medium high. Sprinkle the top of the chicken evenly with 1/2 teaspoon kosher salt and 1/4 teaspoon pepper. Once the oil is hot and shimmering, add the chicken to the pan, top-side down. Let cook 4 minutes, then flip and continue cooking until the meat is cooked through and reaches an internal temperature of 160 degrees, 3 to 4 additional minutes. Remove to a plate and cover with foil to keep warm. In a small bowl or large measuring cup, stir together the apple cider and mustard. With a paper towel, carefully wipe the skillet clean. Add the remaining 2 teaspoons of oil to the pan over medium high. Once the oil is hot, add the apple slices, remaining 1/2 teaspoon salt and 1/4 teaspoon pepper, and rosemary. Cook for 5 minutes, until the apples are lightly tender and begin to turn golden. Return the chicken to the pan and pour the cider mixture over the top. Let cook for 4 to 5 minutes, until the liquid is reduced by half. Serve warm, sprinkled with additional chopped rosemary as desired. This recipe is best enjoyed the day it is made, but can last 1 to 2 days in the fridge. Reheat the leftovers gently in the microwave or on the stovetop with a bit of chicken broth to keep the chicken from drying out. You can swap chicken breasts for the thighs, though I think overall, thighs give this recipe the best flavor. If you use chicken breasts, be sure to watch the cooking time, as it may vary from what is listed in the recipe. I am sharing this recipe and post in partnership with Pick ‘n Save. As always, all opinions are my own. Thanks for supporting the brands and companies that make it possible for me to continue to creating quality content for you! Ohh I love those fresh and juicy apples: I don’t think I use them in my cooking often enough! I actually don’t think I’ve ever had apples as an addition to a meat dish, but I can imagine this will taste very nice. Saved! Vivian, the apples are so lovely paired with the chicken and rosemary. I hope you enjoy the recipe! If you like how apples taste in this dish, try making mulligatawny with tart Granny Smith apples…another incredible chicken dish that also uses coconut, carrots, celery onion, coconut milk, chicken stock, curry and other incredible herbs and spices! So much gorgeousness!!! I need to head to the store ASAP! Thank you so much Amanda. Happy fall! I am ALWAYS on the lookout for healthy, easy chicken dishes (since I basically LIVE on chicken) and this is so going on the menu plan this week! i love apple picking! and what a great recipe for those apples! This skillet is all good things, looks amazing! Love love love the sweet and savory dinners like this one! Apples and chicken are divine together! This is a winner winner (fall) chicken dinner! I’m pretty sure there’s no upper age limit on apple picking – at least, I hope not, since I only discovered it when I moved to the midwest four years ago! This chicken looks wonderful! We’re going apple picking soon, and it’ll be good to have a savory recipe in mind, so that I don’t inundate us with apple desserts for the next two months. Fall is just the best, and anything apples and apple cider is right up my alley this time of year. I cannot wait to go apple picking! Your photos are just great ! Keep on rocking ! I was instantly drooling over this the second I saw it. So pretty, and so fall. Not silly at all Sara! We had roasted Brussels sprouts. Hope you enjoy the recipe! I made this tonight and it was AWESOME! I did find that I needed to bake the chicken for about 30 more minutes. I think my thighs were large (the chickens’ that is!). Just realized I used thighs with bones and it called for boneless. Makes sense why it took longer! Definitely keeping this recipe! Teresa, I am so happy to hear that you loved this so much!! And the bone-in definitely is what would have added to the cook time. Thanks so much for sharing this kind review. Enjoy every bite! Ooops! I got apple cider vinegar instead of just regular apple cider. How do you think it will work with apple cider vinegar? Hi Laura! I actually would not make that substitution. Apple cider is sweet, while apple cider vinegar is very acidic. You could substitute apple juice with a little bit of cinnamon. Otherwise, I would just use chicken stock. I hope you love the recipe! That answered my question! I want to make this right now and gave no apple cider, all other ingredients, including a large pkg of chicken thighs and honeycrisp apples! Can’t wait to try it. I hope you enjoy, Teresa! I like this recipe! It looks very easy. I was wondering if we could substitute the chicken for another protein. For instance, will it work with salmon or pork? I think it would be great with either! Pork would be a bit easier, since it’s simple to cook on the stove top the same way as chicken (salmon I usually sear on the stove, then bake at 425 degrees until it is cooked through). Whichever protein you use, adjust the cooking time accordingly, since both of those proteins will cook in a different amount of time than the chicken. I hope you love it! Erin this look Deeeelish!!! I practically live on chicken… Could I sub boneless skinless breasts for the thighs? Not much of a dark meat eater. Definitely Alison! Just pound it to an even thickness and be sure to watch the cooking time. It may be different than the thighs. Whereabouts do you get apple cider from, everywhere I look it is apple cider vinegar ? Hi Michelle! Apple cider is usually refrigerated. Sometimes grocery stores will have it on a display with the produce in the fall. Otherwise, check by the regular apple juice or ask a store employee. In a pinch, I’d suggest swapping pure apple juice. Whatever you do, do not use apple cider vinegar. The two are VERY different and the dish will taste too acidic. Help! My kids drank the rest of the Apple cider yesterday…can this be altered in any way? Can I make this without it? I know, I could head to the store, but I haven’t the time. Hi Janice! Do you have apple juice? Otherwise, you could use chicken stock, though the dish will have a less concentrated apple flavor. I hope you enjoy it, whichever direction you decide to go! Ok, I’ve read above comments. Apple juice with some cinnamon. I’ll try that. Looking forward to trying this. Thank you. I found This recipe on MyFitnessPal app. Funny, I typed that same time you responded. Thank you so very much. That was fast! I just made this tonight for dinner, the wife and son loved it! It’s now added to our menu rotation! Any other suggestions for meal cooking with apples? I’m so happy you all enjoyed it so much Tim! You can see all of my apple recipes here. There’s a good mix of sweet and savory: http://www.wellplated.com/tag/apple/. BTW, this cooks waaaaay faster if you cover the chicken. I rarely comment on recipes but this one — Apple Cider Chicken — is awesome. Even my family loved it. Can’t wait for leftovers at lunch tomorrow. Super easy, super flavor. Thank you Erin! Awh, thanks Jennifer! I’m so glad you enjoyed the recipe. Thanks for taking the time to leave such a nice review! I’ve made Apple Cider Chicken twice now! Love it! So easy & delish! I use my pineapple corer for the apples – works great! I’m so glad you love the recipe, Dana. Thanks for leaving this nice comment and for sharing the pineapple corer tip! I made this tonight and me and hubby loved it! The instructions are very easy to follow and it’s impossible to mess up the apple cider and Dijon mixture. To reduce prep time I purchased sliced apples from the store, I used a few green ones too and it was delicious as well. Served the chicken with red skin potatoes and green beans. I will be making this again later this fall! Alexis, I’m so glad to hear you enjoyed the recipe! Thanks so much for taking the time to leave this wonderful review! Delicious! I would like to try it after marinating in the cider and mustard to see if it is even more flavorful! If you do give that a try, I’d love to know how it goes! Thanks for taking the time to share how the recipe went, Amanda! Made tonight with honey crisp apples and it was delicious! The apples have an amazing flavor in this dish. Thanks so much for taking the time to leave this great review, Teresa! I’m so happy to hear you enjoyed the recipe! Would this be possible using a slow cooker? Hi Diane! I actually wouldn’t recommend a slow cooker for this. The chicken cooks quickly and using the stove is important to make sure the chicken and apples have a nice texture. If you are looking for slow cooker recipes, you can check out any of these: https://www.wellplated.com/category/recipes-by-type/slow-cooker/. I’ve been working on improving my cooking skills and eating habits and have been trying at least one “outside the lines” recipe a week. Usually something that wouldn’t typically appeal to me. This was that recipe this week. I was scared of the prospect of cooked savory apples. However, we just finished dinner and this blew us away. The apples were really good and a pleasant surprise. However the chicken was AMAZING. This is seriously the most flavorful melt in your mouth chicken I’ve ever made. Thanks for sharing the recipe and I look forward to exploring more of your recipes. Jeni, this comment makes my day! I’m so happy you tried something new and honored that this was your pick. Thank you! I made this for my family, and they said it was bland?? Suggestions for more flavor? Hi Ellen, you could try adding more salt, pepper, and rosemary to taste, or try a different type of mustard! I hope you enjoy it if you do decide to try it again. I’ve been making more and more dinners for my family and I made this tonight. There are no leftovers! My wife and girls absolutely loved it! My youngest (7) asked when we can have it again. Thanks for the great recipe! Hooray! I’m so glad to hear the recipe is a hit, Tony. Thanks so much for reporting back! I’m happy to hear you enjoyed it, Shalin! Thank you for taking the time to review the recipe! This was fantastic! So much flavor! The chicken thighs are perfect. So juicy. I feel like if it was made with breasts it wouldn’t be nearly as tasty and juicy and the chicken would likely get dry and too difficult to chew. Try thighs! I will definitely cook this one again. Lisa, I’m so happy to hear this recipe was a winner for you! Thanks so much for taking the time to leave this review! Hi Lisa, a serving is one fourth of the whole dish. I didn’t measure it at the time I made it, so unfortunately I don’t have a precise number to provide. If you love chicken and apples, but don’t like Dijon, what seasoning would you suggest? Hi Jessi! You can just leave it out or add a tablespoon of lemon juice if you feel like it needs a little extra pop. Enjoy!